This section describes how to count multi-byte characters using php_mbstring.dll module. 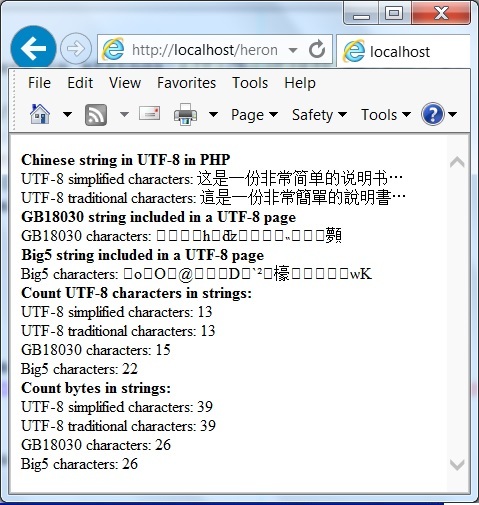 Once you have configured PHP to use php_mbstring.dll module, you are ready to use multibyte string functions to manipulate Chinese character strings as characters instead of bytes. mb_strlen() counted Chinese characters correctly on UTF-8 encoded strings. 13 characters in both simplified and traditional character strings. The '...' as the end both strings is 1 special Chinese character. mb_strlen() counted Chinese characters incorrectly on both GB18030 and Big5 encoded strings. This is understandable, because mb_strlen() is assuming UTF-8 encoding based on the PHP configuration settings in php.ini. In for mb_strlen() to work correctly, you need to change the setting to mbstring.internal_encoding = GB18030. Comparing with counts of bytes returned by strlen(), we known that 1 Chinese character is mapped to 3 bytes in UTF-8 encoding, 13 characters vs. 39 bytes. This is only true in this test. There may be some Chinese characters that need to be mapped to 4 bytes in UTF-8 encoding. Looking at byte counts of GB18030 and Big5 character strings, we know that 1 Chinese character is mapped to 2 bytes in GB18030 and Big5 encodings. Again, this is only true in this test. Some GB18030 characters are mapped to 4 bytes.